Editors: Hanson, Lindsey K. and Essenburg, Timothy J. 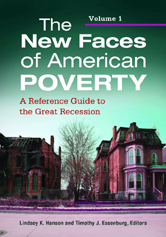 This is one of the first books to focus on the impact of the Great Recession on poverty in America, examining governmental and cultural responses to the economic downturn; the demographics of poverty by gender, age, occupation, education, geographical area, and ethnic identity; and federal and state efforts toward reform and relief. Introduction: Why Care about Poverty? Section 1: The Great Recession: What Happened? Section 3: How Did the Great Recession Affect Poverty Rates for Demographic Groups? Conclusion: What Can Be Done about Poverty in the United States?